Broomfield Methodist Church is situated two miles north of Chelmsford on the main road between Chelmsford and Braintree. A Methodist presence has been in Broomfield village since the mid 1800’s. The current church building was opened in 1963 replacing a 1911 building. A Church Hall was erected on the site in 1938 and was extensively refurbished in 1999. It is now widely used by local community Groups which also provides a valuable source of income for the Church as well as a community focus. A thriving Play Group meets in the Church Hall each morning during term time and a Mums and Toddler’s group meets each Wednesday and is run by Play Group staff. The Chelmsford Silver Band practice in our Church Hall on a Wednsday evening; a Dance Group runs classes for a wide range of ages during Saturday and also on Monday evenings for older children. An Irish Dance academy meets on a Thursday evening. We endeavour to engage local schools in Church events such as our Craft Club and Messy Church activities for children. Services are held every Sunday (other than when our congregation join with other churches in the area) at 10.30 am All ages are welcome to partake the elements in our monthly Communion services whether members of the Methodist church or not. The Methodist and Anglican Churches signed a covenant in 2005 which was renewed in 2015 to join together in Christian outreach and service to the community in Broomfield wherever possible. For further details of St Mary's Church, Broomfield visit St Mary's Church web site. Updated for the Church 100th anniversary in 2011. The Primitive Methodists in Broomfield applied for permiss­ion to use the old British School in School Lane, Broomfield, this permission was readily given, and in 1884 a small meeting was formed. This continued precariously for a number of years and often preachers had no congregation! In 1898 the society had ceased to meet, but in 1900 a Chelmsford Methodist Circuit Quarterly Meeting statement reads "re Broomfield: That Broomfield remains on the Plan without appointments during the quarter, there having been no indoor congregation for a long time and no income for years, the services had been held in an old school rent free for 16 years which the Wesleyans vacated because they were unable to form a society. The Primitive Methodists had never had a society and only 2/6d was collected from all sources for about 4 years. During the same period congregations were only two or three and frequently none. It was felt that things might improve if a cottage or a piece of ground was obtained." In 1905 it was reported that no services had been held at Broomfield for five years. But behind the scenes efforts were being made, and on 22nd September 1909, when a Bro. W. Sayers was a steward at Broomfield, application was made to the Methodist District Building Fund to purchase land at Broomfield from Wilfred James Stubbings. Permission to build Church on the site was obtained and on 28th January 1910 the Indenture was signed, the consideration money being £100, and the first Trust came into being. Preaching plans for 1909 and 1910 reveal two members at Broomfield, and a note appears on one of them that "during the year we have entered Broomfield". During the winter of 1909 from 3rd October, Mr. and Mrs. A.T Batting, then living at 29 Main Road, Broomfield, opened their house for the services and frequently during the summer of 1910 open air work was indulged. A foundation stone had been laid on 5th October 1910 and the ceremony was probably attended by the Rev. H.J. Taylor, the then deputy treasurer of the Primitive Methodist Missionary Society. The church was opened on 15th February 1911. The door was unlocked by Mrs. Pritchard, wife of the Rev. Pritchard of Great Bardfield, at 3 pm. followed by a sermon by the Rev. E.J. Taylor. At 5 pm there was a public tea. followed by a meeting at 7 pm. presided over by Mr. J. Stacey Reeve when the speakers were Rev. H.J. Taylor, Rev. J,A. Wales (Superintendent Minister) and Alderman H. Clark who is understood to have collected the first £100 for the building fund. During the last quarter of 1910 the Society Steward was Mr. W Sayers with a membership of two, but no quarterage was paid. .'Mr. A. Batting’s name was added for the first quarter of 1911 then in the next quarter Messrs. T. Saunders, A.T.. Batting and F. James took over, Mr. E..J. Squires becoming Chapel Steward. The Sunday School commenced on the Sunday following the opening with three boys, Alfred and Rupert Batting and Gordon James; Mr. A.T. Batting was the first superinten­dent. On the second Sunday eight children came and by the end of the year the numbers were up to 48. The first trust secretary was Mr. S. Britton and the Super­intendent Minister was the treasurer. During the summer of 1911 camp meetings were held, and a Sale of Work and Garden Party, the first of many, was held at Patching Hall by kind invitation of Mrs. F Partridge, followed by the Circuit Quarterly Meeting on 6th September 1911. According to plans, the work of temperance in the shape of the Rechabites commenced in 1912 under the guidance of Mrs. Batting, and the Women's Own meetings started in 1918. During 1917, under Mrs. Woods of near Mill Lane, a Junior Christian Endeavour was formed which met until 1920; it recommenced in 1926 as a Senior Christian Endeavour. At the time of the opening of the church the debt on it was nearly £400. Collections began with a total of between 3s. and 4s. each Sunday. Two Sundays’ collections per quarter were used to reduce the debt. Half of the remaining amount at the end of each quarter (about 30s.) was usually also used for this purpose, while the same amount went to the Circuit. The debt on the old church was finally cleared at a Gift Effort in March 1930, there being £10 surplus which was set aside to start a Building Fund for a Hall. The certificate of worship No. 44584 was issued on 20th December 1910, whereas it was not until 8th July 1919 that a marriage authorisation certificate No. 21822 was obtained. The first marriage after the certificate was obtained was that of Mr. and Mrs. A.E. Barker on 23rd July 1919. The certificates were cancelled on 3rd December 1962 on the demolition of the old Church, and after the new Church was built was superseded on 25th September 1963 by certificates for the present church. By 1930, when the debt on the church was finally cleared, the society had grown and was seriously hampered by lack of accommodation, and so consideration was given to the building of a hall at the rear of the church. In December 1937 plans were approved, and on 3rd September 1938 the hall, built at a cost of nearly £1,800, was opened by the Rev. Dr. W..L. Wardle, President of Conference, At the same time a porch was built on to the church, and central heating was installed, together with chairs in place of the forms which were transferred to the hall. As befits Primitive Methodism, music held a strong place at Broomfield, and for a number of years there was a small orches­tra, consisting mainly of violins and cello with woodwind’ In August 1948 a pipe organ dedicated by the Rev. A.E. Binks, Chairman of the London N.E. District, was installed at a cost of £418 replacing the instrument purchased from Little Waltham .Congregational Church at a cost of £2. This organ was re­installed in the gallery of the present church. From 22nd to 26th February 1961 50th anniversary Jubilee celebrations were held, but it had been apparent for some time that, to meet the needs of the locality, a new church was essential. Members of the church had for a number of years been working with this aim in view. Help was also forthcoming from the Trustees of the High Street Church, Chelmsford, together with the Rank Trust and the Methodist Chapel Committee. It was necessary that the old church should be demolished. On 15th July 1962, in the presence of the sole surviving founder member, Mr. T. Saunders9 on his 78th birthday9 the closing services were conducted by Mr A.E. Barker in the morning and the Rev. Norman Povey, the Superintendent Minister, in the evening. On Monday, 15th October 1962 at 9 a.m. Rev. Povey conducted a short service in the old church, and demo­lition started the next day. In the meantime Sunday services were held in the hall. The new church, designed by Messrs Dawney and Carpenter of London, with Mr. Wilfred Thick as Quantity Surveyor, was erected by Messrs J. Arnold (Chelmsford) Ltd. at a cost of over £16,000. On Saturday, 18th May 1963 the foundation stone was laid by Mrs. L. Vellacott in memory of her mother, the late Mrs. H..H. Partridge. Then on Saturday, 21st September 1963 the church was dedicated by the Rev. Norman Povey, the guest speaker being the Rev. C. Leonard Tudor, General Secretary of the Home Missions Department. Towards the close of 1963 it became known that, in addition to her many other gifts to the church, a legacy of £500 had been left by Mrs. Partridge. On the evening of Sunday, 24th January 1965 during the Week of Prayer for Christian Unity the Rev. J.A. Newbury, the Rector )of Sandon, conducted the service. This is believed to be the first occasion an Anglican minister had done so at Broomfield. Since then others have followed, and in 1975 on January 22nd again during the Week of Prayer for Christian Unity, clergy from the United Reformed Church, Baptist Church, Salvation Army, Church of England (three) and the Roman Catholic Church, as well as our own minister, the Rev. Reg Buckmaster, shared in the conduct of the service. In July 1981 the Rev. Gary Sanderson of the United Methodist Church in Wyandotte, Michigan, U.S.A., exchanged churches with the Rev. Ron Taylor, conducting four services at Broomfield, which included two baptisms. The 1980’s saw a rise in the number of young families worshipping at Broomfield and this resulted in a lively and flourishing Sunday school. The Sunday school regularly led worship at Christmas and at the Sunday School Anniversary, exploring a number of themes such as Dreams, Fish and Fatherhood. A Junior Youth Club was revived as was the badminton Club providing a further forum for the younger congregation’s involvement. Church picnics were also enjoyed by the whole church family at various venues- Hylands Park, Little Baddow and Roxwell. The 1990’s saw many of the children of this generation leaving to go to university and many moved away from Chelmsford. Several new ventures began in the 1990’s under encouragement from Rev Ken Nicholls, including Chuck wagon, where members of older congregation enjoy an afternoon out in the countryside or at the seaside followed by a supper at the church. In November Chuck Wagon usually visits a local garden centre with opportunities to do some Christmas Shopping. Church lunches were also a feature of the 1990’s and the ever popular “Spud and “Pud” was also founded. Spud and Pud is a time for all the church family to meet together for fellowship, coffee and a lovely lunch of soup, baked potato with fillings and, of course, apple pie! 2000 saw the opening of newly Refurbished Church Hall by the Mayor of Chelmsford. The refurbishment scheme, which included the enlargement of the kitchen and provision of disabled facilities, was master minded by Brian Jervis and Leonard Windsor, our property managers and has resulted in the building being widely used by a number of local groups including the Jack and Jill pre-school, two dancing schools and the Chelmsford Silver Band. The total cost of refurbishment was £42,733 and work was completed in several phases between 1998 and 2000. Once the Church hall had been refurbished our tireless property managers turned their attention to the much larger scheme of refurbishing the church, now over 40 years old, to make it more adaptable to twenty first century worship. The kitchen was enlarged and fully fitted out, even with a dishwasher!! A new vestry was built and the old one became the church office. The worship area was designed so that the Communion Rail, Pulpit and Lectern can all be moved - a great asset which has allowed the church to be used for concerts as well as more informal acts of worship. 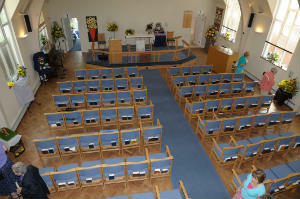 New comfortable chairs were installed, to the relief of many in the congregation; once again all moveable. Doors and toilet facilities were enhanced to comply with Disability laws. A projector and screen were also installed so that images can be used to enhance worship and the hymns and bible readings projected for all to see. It also means that the church could be hired out for conferences and other community meetings. The total cost of £112,000 was funded by grants from Church and secular sources as well as an intensive fund raising effort. The first service in the newly refurbished church was held on Christmas Eve 2005 and was dedicated in a service led by Rev Tom Stuckey, the then President of Conference on March 4th 2006. Also taking part were the Superintendent Minister, Rev Bernard Arnold and Rev David Faulkner, Broomfield’s minister. Rev Peter Ball of St Mary’s Church took part in the service representing the covenant signed that year between the two Broomfield churches. The end of the 1990’s and the 2000’s saw the church reaching out into the community through school assemblies, Craft Club, Holiday Club, family Fun Day and Messy Church. To date there have been nine Holiday Club’s with exploring themes such as Moses, Daniel, Noah and Ruth as well as some of the parables and miracles of Jesus. Up to 50 children can be registered, (and in 2010 the books were full an hour after registration opened). As well as hearing the bible stories the children also participate in music, drama, team games and craft activities. The week culminates on the Friday evening with a family BBQ and an opportunity for the children to show their parents what they have been doing all week. We have held three Family Fun Days where the church is open for activities for children of all ages including face painting, nail decoration, craft activities, games and entertainment all based around a theme. In the current climate of economic hardship we are pleased to put this event on free of charge. We have been challenged to look at new ways of doing church, now that the nature of Sunday has changed in twenty first century Britain. Every six weeks we hold Messy Church on a Monday evening after school. The church is buzzing with families as they participate in messy craft activities followed by a short act of worship. On the other Mondays during term time around 18 children enjoy coming to Craft club where they can learn new skills and then enjoy a bible story or a story with a strong moral message. In such ways we are reaching out to families in Broomfield and beyond and providing church for them on a Monday. The church' members also outreach into the Community through CHESS,( Churches Together Homeless Charity), Street Pastors and the Eucharistic Ministry and ward chaplaincy at Broomfield hospital. In 2005 we signed a covenant with our friends at St Mary’s Church in the village and a number of joint ventures resulted from this including the taking of school assemblies, JAM (Jesus and Me) Club at Broomfield School, joint bible study groups, Lent courses, and the Holiday Club. We also held regular joint services at Christmas for the Village Carol Service, Easter, on Remembrance Sunday and in the summer for Village Praise on Church Green as well as an annual service to celebrate the signing of the Covenant. In 2010 Rev Tony Shrimpton, a retired Methodist Minister living in Maldon and former superintendent of the Chelmsford Circuit, agreed to become the minister of the Church on a part time basis. This followed a reduction in Circuit ministers to three following the departure of Rev David Faulkner. During his ministry the Church family began to grow again and for the first time for many years, new people were accepted into Membership. The 100th anniversary of the Church was celebrated through a series of events, concerts and reunion services. House groups were reformed and began to meet regularly. A new mission statement was adopted by the Church Council ' Seeking to love and serve God in the Community and the wider world'. During this period the church became re-vitalised and new families began to worship regularly. Children's work continued to be an important part of the church's outreach through Messy Church and Craft club for junior school age children. Rev Shrimpton retired from active ministry of the church in 2014 when, being unable to secure a full time minister, a methodist minsiter from South Africa, Rev Mike Crockett, dedicated the final year of his 6 yr ministry in the UK to Broomfield and another Church in the Circuit. Rev Mike returned to S. Africa in June 2015 and the church was without a minister until September 2015 when Rev Abe Konadu-Yiadom ( Rev Abe) took up her first ministerial appointment in the Chelmsford Circuit with responsibility for Broomfield and Moulsham Lodge churches after training at the joint Anglican/Methodist seminary in Birmingham. During this time the membership of the church was 54. Rev Abe became seriously ill in August 2016 and was unable to minister to the church for several months until Easter 2017. Due to the retirement of ministers in the Circuit from September 2017 there would be only the Superintendent minister ( Rev Mike Lewis, and Rev Abe Konadu-Yiadom who was still a probationer presbyter) . The Methodist church Probationers Committee decided that she would be better supported as a probationer in a Circuit with more ministerial support to enable her to complete her probationary period. Following her departure in August 2017. the Circuit was unable to obtain a new minister so Rev Mike Lewis (superintendent Minister) assumed pastoral responsibility for the church as well as the four other Central Chelmsford Churches at Trinity, Hall Street and Moulsham Lodge until his retirement in August 2019.